but whose place no one else can take." Today is Mother's Day. In honour of all Mothers around the world, I thought the best subject of today's post would be about the importance of capturing images of the women in your life. 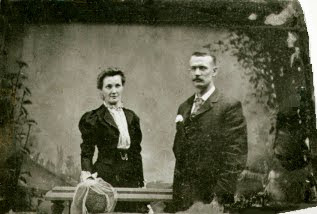 Most of the postings on this site are about photographic restorations and the history and insights into photography. Today's subject is going to deviate just a little bit. It will not only involve photography, but original artwork as well. It is still, all about Mama. In 2009, a new restaurant was to open in Pigeon Forge, Tennessee, called "Mama's Farmhouse". The all-you-can-eat menu would consist of recipes from the personal collection of the female matriarch of the owner's family. Country Fried Steak, Roasted Pork, Sweet Potato Casserole, Banana Pudding, Peach Cobbler.... and so much more, all made from scratch from Mama's original recipes and served in abundance. YUM, YUM! The entire decor of the restaurant was to be a photographic history of Mama and her descendants. Mama's own portrait was to become the trademarked symbol of the restaurant, but there was a problem. There were no appropriate photographs of Mama that could be used as the trademark or as the focal point of the restaurant's decor. Only two photographs existed of Mama. 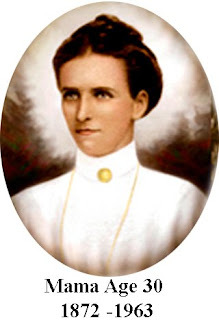 One was from the early 1900's where Mama stood in the living room of the family home surrounded by her husband and children and a framed and shrouded portrait of a deceased member of the family. (This was one way to take a family portrait and include members that had already passed on.) Mama had a head in the professional looking portrait, but her main body and shoulders were obscured by other family members. Mama was in her late 20's at the most in this picture. I was able to take this photograph and airbrush out the other members of the family to create a younger version of Mama, but, this certainly would not do for the restaurant's trademark portrait. The only other photograph ever taken of Mama was recorded at the end of her life just before her death in 1963. The problem with this photograph was that it was a tiny, blurry image of Mama standing outdoors in bright sunlight with two other unknown woman......wearing a hat. For the restaurant's trademark portrait Mama needed to be looking aged, yet lovely, and as most of the family remembered her, but definitely not blurry and out of focus and, most certainly, NOT wearing a hat. With the recommendation of other artists and framers, the owners arrived at my Heirloom Art Studio in hopes that I would be able to assist with the retouching, enlargement and restoration of the family portraits for the restaurant decor. 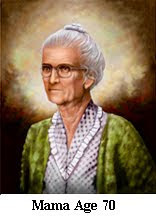 They also hoped that, with my reputation as a fine art portrait artist, I would be able to create a portrait of Mama suitable for the trademark and name of the restaurant. This was going to be a challenge, but one that I could certainly enjoy as my specialty. The family set about locating one photograph after another which I would subsequently enhance, colour correct, restore, enlarge and deliver for framing. Creating the needed portrait for Trademark Registration, would take an entirely different route. After enlarging the 1900's portrait of Mama to a 20x24 image and airbrushing out the other family members, I delivered a key portrait of Mama (seen in the top photograph above) framed in an antique reproduction walnut oval frame with convex curved glass. Mama appeared in all her early beauty and was hung on the wall of the restaurant. Now began the fun part. Did you know that all of human anatomy is mathematical? Every part of the head and body can be measured to exact size and standards. What is more fascinating is that the body, in particular the head, ages mathematically as well. The eyes recess into the eye sockets according to measurements, the ears drop, the chin line becomes less than smooth and all shifts according to a ratio of measurements of proportion to age. You see this mathematical shift miraculously happen on forensic television shows through the advances of digital technology, but my studio isn't as supplied with that high end digital software. We would simply have to rely on the original art and proportion knowledge on which the software is based and upon which I am greatly familiar. I first scanned the negative of the newly created portrait of Mama in her twenties into my computer. Using digital brushes from high end drawing software, I began to hand draw on top of the first portrait (no buttons were pushed to accomplish this task) to age Mama into her seventies as the customer had requested. The only point of reference which I had to make the changes were my years of knowledge and expertise, mathematical calculations and the very blurry photograph from 1960. Slowly and surely Mama's skin sagged, muscles relaxed, her hair thinned and lost it's colour. Her chin line became less defined yet the sparkle in her eyes and that tiny little smirk of hers remained. When my digital drawing was completed Mama was at last, and incredulously, delivered to the customer appropriately aged into her seventies and in appearing in full colour. The customer was delighted and said the portrait was an exact depiction of what the current descendants remembered of her. I was, once again, overjoyed by my accomplishment and breathed a sigh of relief that this major portion of the restaurant project was complete. Or....perhaps I was a bit too hasty in my contentment. Within a week, the customer phoned stating that perhaps Mama was a bit too old (and unfattering?) to be a permanent Registered Trademark. The portrait was certainly considered accurate, but would it be possible to reduce her age to her fifties and create a portrait more lovely in nature? Why certainly, was my reply and I set to work just as before to age Mama once again, only to stop this time short of the math that would take her too far into her "golden years". Mama, in her seventies, was attired in the customary sweater she always wore and which was seen in the blurry photograph the family provided. 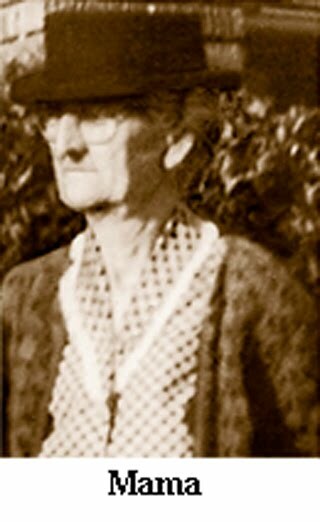 If Mama were to appear in her fifties, I would have to get creative and find appropriate clothing for the new portrait. According to my calculations, Mama would have been fifty in the 1920's. Eeek! This would have been the Roaring 20's, the days of the "Flapper" dresses and clothing slightly riske for a trademarked portrait. Fashion sported sleeveless dresses in the scoop necked t-shirt style and, although this was high fashion and certainly appropriate for the time, I didn't think it would make a good head and shoulders trademark for our distinguished Mama. To the history books and fashion plates!! 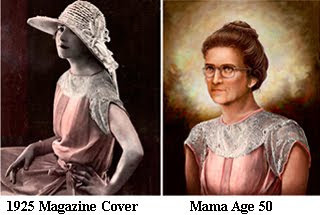 After pouring through several publications in my vast library and drawing upon my many years as a stage and costume designer, I finally located the perfect dress for Mama on a 1925 magazine cover. Mama would appear in a soft coral pink chiffon dress with lace bodice appropriate to the twenties yet sophisticated for her age and representation of the restaurant. I delivered the portrait and the client was, yet again, pleased and overjoyed with my work. Mama had been brought back and would now be well represented throughout the Farmhouse Restaurant in several stages of her life. A large convex glass oval portrait was displayed in the lobby above an ornate fireplace and mantle. Next to the mantle would hang a large, original family tree and history of Mama and her descendants which I also hand painted and framed for the customer. 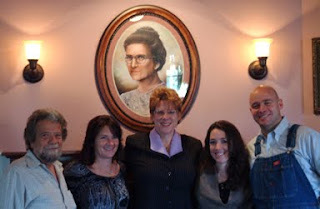 Mama's Farmhouse Restaurant opened in the spring of 2009 with a VIP Reception to which I was pleased to be invited as a guest of honour and pose for pictures in front of Mama's Portrait with Mama's descendants and owners Bruce Johnson and Melinda (left) and Kelly and Jonathan Wimmer (right). Mama was a Great Great Grandmother instead of just someone's Mother. Through the knowledge of Mathematics and the talents and skills of my artwork, I was able to bring her back and deliver her to a family, but it is important to remember that nothing can replace an original photograph of a loved one. I might be able to substitute a Mother's photograph but nothing can take a Mother's place. Today, on this Mother's Day Sunday, get out the camera, take lots of photographs and know that each and every day henceforth you can say......I remember Mama. My daughter, Tania Renae, is, at this very moment, on a plane returning home from a visit to a friend in British Columbia. She has already phoned with her best wishes for my good day and says her appearance tonight, loaded with hugs, will be my special Mother's Day gift after her absence. I couldn't ask for anything more. To my mother, Betty Ives, in Ontario, Canada, and to all Mother's, and Mother's to Be everywhere, I wish you all an equally joyous Happy Mother's Day. Here's hoping your day is filled with sunshine, laughter and lots of family with camera's. "Oh, Dear, what could the matter be? Dear, Dear, what could the matter be? Oh, Dear, what could the matter be? Johnny's too long at the Fair." Many of the customers who arrive at my Heirloom Art Studio for fine art or restoration services are deeply involved in genealogical research. They are often desperately seeking duplicates or restorations of photographic images of past generations which they, themselves, own or which they have begged, borrowed (and, believe it or not, sometimes.......stolen) from other family members. Anyone involved in historic or genealogy research can attest that information, as well as photographs, often turn up at the oddest times and are sometimes found in the strangest places. You just never know when that one break in your research will happen. This posting is about just one of those unique (if not fortuitous) occasions for one of my clients. The phone call to the Studio began like any other with one of the eventual questions about my services: Could I duplicate a Tintype? My immediate answer was, "Absolutely", but I was cautiously suspicious about the item because the general public is often not knowledgeable about photographic history and tends to label any photographic image appearing on metal as a Tintype. When the customer stated her metal photograph was nailed to a three-quarter inch thick wooden block, my suspicions were becoming increasingly confirmed that she did not have a Tintype in her possession. I asked if the photograph had a black or copper base. Her answer confirmed my thoughts. "The metal looks like copper," the lady replied "but, it's the strangest thing....when you turn the photograph sideways the image looks like a negative." Aha! 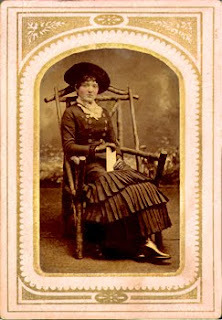 This is definitely NOT a Tintype and I proceeded to explain that most likely (sight unseen) she was holding a Photogravure plate adhered to a block of wood for the purpose of printing an image most likely on a press. As to any restoration or reproduction, I instructed the woman to bring the piece into the Studio for evaluation and further discussion. Throughout early history, books and manuscripts were mostly religious texts. These were painstakingly reproduced by hand. A picture comes to mind of selfless Monks sitting on hard benches in cold, monastic rooms, hovering over handmade papers for days on end, elegantly adding decorative touches to ornate letters in order to reproduce scripture and text. The main method used to reproduce photographic images and textual thoughts in mass production remained, for much of history, woodblock printing. Skilled artists would carve reverse images in the surface of wood which would then be hand inked using a roller and hand pressed onto paper. This was a detailed, but still labour intensive way to create multiple images and the only way to produce a portrait image. Around 1040, the first known movable type system for reproducing text was created out of porcelain pieces, in China, by Bi Sheng. Sheng used clay letter characters, which broke easily, but by 1298 AD, Wang Zhen had carved a more durable type from wood and developed a complex system of revolving tables and number-association with written Chinese characters that made typesetting and printing much more efficient. Beginning in approximately 1436, Johannes Gutenberg and partner, Andreas Heilmann, owner of a paper mill, began work on the first version of the printing press. Around 1450, in Europe, Gutenberg introduced what is universally regarded as an independent invention of movable type. Movable type is the system of printing and typography using movable pieces of metal type, made by casting from matrices struck by letter punches. Movable type allowed for much more flexible processes than hand copying or block printing. Gutenberg was the first to create his type pieces from an alloy of lead, tin and antimony – the same components still used today. Compared to woodblock printing, movable type page setting was quicker and more durable. The metal type pieces were sturdier and the lettering more uniform, leading to standardized typography and fonts. The high quality and relatively low price of the Gutenberg Bible (1455) established the superiority of movable type and printing presses rapidly spread across Europe and later all around the world. Today, practically all movable type printing (if it is still used in this digital age) ultimately derives from Gutenberg's movable type printing press, which is often regarded as the most important invention of the second millennium. Photogravure, however, is an intaglio printing or photo-mechanical process. A copper plate is coated with a light-sensitive gelatin tissue which had been exposed to a film positive. The image is then etched, resulting in a high quality plate which, when printed, can reproduce all the detail and continuous tones of a photograph. The etched image is made up of small depressions in the surface of the printing plate. The cells are filled with ink via a roller and the excess ink is scraped off the surface of the plate with a blade. A rubber-covered roller presses paper onto the surface of the plate and into contact with the ink within the etched cells. The earliest forms of Photogravure were developed in the 1830s by the original pioneers of photography itself, Henry Fox Talbot in England and Nicéphore Niépce in France. 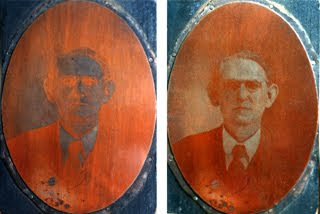 They were seeking a means to make prints that would not fade, by creating photographic images on plates that could then be etched. The etched plates could then be printed using a traditional printing press. These early images were among the first photographs, pre-dating daguerreotypes and the later wet-collodion photographic processes like glass Ambrotypes. Fox Talbot worked on extending the process in the 1850s and patented it in 1852 under the name "photographic engraving" and 1858 as "photoglyphic engraving". Photogravure, in its mature form, was developed in 1878 by a Czech painter, Karel Klíč, who built on Talbot's research. This process, the one still in use today, is called the Talbot-Klič process. It is relatively easy to identify a Photogravure print. Printed images have warm blacks which often appear soft but, register an amazing range of subtle gray shades. The unique tonal range comes from Photogravure's variable depth of etch, that is, the shadows are etched many times deeper than the highlights. Unlike half-tone processes which merely vary the size of dots to distinguish light areas from dark, the actual quantity and depth of ink wells are varied in a Photogravure plate and are often blended into a smooth tone by the printing process. Look at the print with a good magnifying glass, and you will see a characteristic honeycomb appearance. This is caused by the grid used in the printing process to etch the plate. The dark areas will often seem pitted. Because of its high quality and richness, Photogravure was used for both original fine art prints and for photo-reproduction of works from other media such as painting reproduction. Due to the high cost of the metal used in the process, expensive and exquisite books of art produced using this method are often referred to as Copper Plate editions. Photogravure is distinguished from Rotogravure in that Photogravure uses a flat copper plate etched rather deeply and printed by hand, while in Rotogravure, as the name implies, a rotary cylinder is only lightly etched and it is a factory printing process for newspapers, magazines, and packaging. Here is an odd fact: In France the correct term for Photogravure is Héliogravure, while the French term Photogravure refers to ANY photo-based etching technique. Gravure printing is/was usually used for long, high-quality print runs such as books, magazines, mail-order catalogues, packaging, and printing onto fabric and wallpaper. It was also used for printing postage stamps. But, what of the image in question belonging to our Studio customer? The woman from the phone call arrived at the Studio and produced her photographic plate. The image was, indeed, a Photogravure plate of copper attached to a block of wood by short, large headed nails. You can see the exact block in the photograph above. The black ink stains on the wood confirmed that it was created for printing purposes. I provided the woman with a brief outline of the purpose and method of creating her possession, then asked if she knew the man in the portrait or how she had acquired the antiquated piece. "Well, that's a funny story," the woman responded. "I am tracing my family history. I have been searching for a photograph of my Grandfather but couldn't find one anywhere and no one in the family seems to have one. He was a very prominent man in Knoxville, Tennessee, where I live." "One day," she continued "I decided to check out a flea market at the local fair grounds. I was rummaging through a box of stuff in a particular person's booth and picked up this unusual item. I had no idea what it was but, it looked like a weird photograph. When I turned it over, there was my Grandfather's name!!!" Sure enough, the woman turned over the piece for me to view and there, neatly inscribed in fancy pencil script, was the full name and address of her Grandfather. What an incredible find! The woman simply had to purchase the block and was fortunate enough to obtain it for a mere five dollars. Had she informed the seller of what importance the piece was to her family history or if either had known what the item really was, I am certain the final purchase price would have been exceedingly more. Ignorance is sometimes bliss and I usually caution my listeners to ere on the side of the unknown when transacting any such purchase. As for my contributing services, I provided the lady with two types of reproduction. Using traditional printing tools and methods, I inked the plate and printed a one-of-a-kind fine art Intaglio print on acid free, fine art paper suitable for framing. I then went into the darkroom and photographed the plate, produced a negative which I reversed, restored and printed in multiple enlargements for all the family members. The final task was to approximately date the photograph and send the woman on her way to the Knoxville News-Sentinel Newspaper. The objective there would be to see what could be obtained in the morgue (the proper name for newspaper archives) in respect to any story publicized about this Grandfather who had gone missing so long ago. Several days later the woman phoned to give me an excited report. The newspaper had located the published story about her Grandfather complete with a photograph printed from the Photogravure plate now in the family's possession. It seems that Grandfather had been presented with some award for which he displayed, in the photograph, a pin which was only vaguely discernible on the lapel of his suit. The newspaper supplied the woman with a copy of the article and photograph from their files and Grandfather's image and accolades were once again back home and proudly added to the family history. An interesting note is that, nowadays, the Photogravure and other antiquated printing processes are undergoing something of a revival. As computer and laser technology have driven down the cost of producing the metal printing plates, these machines have opened up many interesting, innovative uses for the process of Photogravure, or photo etching as it sometimes called these days. As digital reproduction becomes more readily available to the public, fine artists and craftsmen are turning back to the specialty processes where their artwork and images are becoming highly praised, valued and sold as more exclusive fine art and decorative creations. Hmmm....what goes around, comes around, eh. As for the moral of today's story...the next time you are digging through someone else's pile of junk you just never now what, or who, you are going to discover. It might not be Johnny who stayed too long at the fair, but who would figure your own Grandfather might follow in his footsteps only to come home more than eighty years after he disappeared. Better late than never, I believe. For this posting I thought I might leave you with a more unique thought. I have an astounding quirk of personality in that I can often be found proclaiming that I would never consider doing something more than once any more than I would devote the rest of my life to a particular artistic style or technique to which I have recently been introduced. This proclamation often leaves me humbled before my friends, family and peers when I find myself continuing with anything I've learned years after so profoundly verbalizing my first opinion of disdain. One of these statements takes me back to the late 1970's when I was first introduced to the fields of photographic and fine art restoration. I was studying photographic retouching at Winona, the Professional Photographers of America School of Photography, now located in Atlanta, Georgia. Under the direction of the world renown artisan and photographer, Helen Yancy, I was being instructed to use my artistic abilities and an airbrush to photographically, and flawlessly, alter, enhance and restore photographs. I had never before used an airbrush as an artistic instrument and found myself struggling to control the variable capabilities of the unfamiliar tool. As the week's instruction went on and my battle to conquer this new instruction continued I heard myself saying, "If you think I would do this for a living you are out of your mind". Here it is in the twenty-first century and I have spent every day of the past thirty-one years (among other specialties) restoring, altering and duplicating photographs. As I built an internationally known business of fine art and restoration services, taught at home and internationally and built my reputation up to become one of the top eight artisans in the portrait, photographic and restoration fields, I have chewed and eaten every word of my so long ago uttered statement not once, but many times over. I once said I couldn't see myself doing photographic restoration or alteration work for a living yet, looking back, I cannot think of anything more rewarding both financially and, more important, emotionally. Even though there is a digital airbrush in there for those who choose to use it, the computer now takes the place of many of the old photographic art and darkroom techniques. It gives a person the capabilities to do some of the retouching and restoration work themselves that was previously only supplied by specialists in the field. Many photographers remove their subject's loose hairs, blemishes, add interesting backgrounds, text and special effects to the photographs they capture and I no longer have to face stacks and stacks of the kind of work I once supplied to photographers and clients in seventeen countries around the world. I can now concentrate on the work required of a craftsman (or woman) and restore original photographs and paintings, duplicate historic and aged photographs with old world darkroom techniques and create artistic works where portraits, backgrounds, alterations or restorations could only be achieved because of my personal talents and skills. Regardless of the medium, equipment or tool, I am returning to my customers a one of a kind work of art that is near and dear to their heart that could be created by no other. My work is artistically unique and, as such, will be cherished for many generations yet to come because it Brings Back Memories Of Another Time. So much of my work is emotional. Tears of remembrances and hugs of joy often accompany the time I spend in consultation with my clients. This is the happiness and contentment I get from my work and, today, I would like to express some of that emotion surrounding my work by posting the following verse. This poem was written by a fellow member of the Professional Photographers of America and printed earlier in the January 1986 Professional Photographs Magazine. These words express the range of emotion that is derived by the work that myself, and those in my industry, derive from working with treasured images of our customer's past. One couldn't ask for anything more than to be rewarded by their work and truly fulfilled by it when the day is done. A tear upon her cheek. Can you repair this photograph? For fifty years I felt his touch. Now deaths torn us apart. To ease the aching of my heart. And brightened up his eye. How much? She sobbed, it matters not. Is the dearest thing I own. The months slipped by so swiftly. I saw her now and then. She paid her bill again. And I went to say good bye. ...It was her last request. She left to fade away. On this, her final day. Went a tiny part of me. We weave into each photograph. I have mentioned in the past how fortunate I am to come from a family that saved what seemed to be meaningless items of the time, but items that turned out to be of the most treasured value in recording my family's heritage. One of the most cherished of all the possessions passed down to me was my Great Grandfather's Ditty Box. 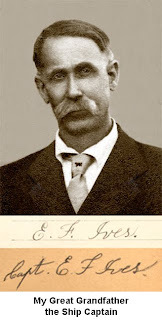 Great Grandfather, Edward Francis Ives, began his younger years as a ship's carpenter. I think of him almost every day in my Heirloom Art Studio as I have many of his hand tools which I use daily in my work. I particularly love his small hand drill. This scaled, precision instrument I use every time I frame artwork and am required to make tiny, accurate drill holes in the back of picture frames to hold screws for hanging mechanisms. Frank (or E.F. as he often signed his name) worked his way up through the ranks until he became a licensed sailing Captain on the Great Lakes, particularly on the Canadian side of Lake Erie. A Ditty Box acts as a sailor's strongbox for personal possessions. Above you will see Great Grandfather's box and notice the hand painted trees and corner decorations in black paint. No one recalls who painted the decoration but, as I have many small drawings of ships on the water drawn by Frank himself, I prefer to believe the decoration was personally painted by my ancestor. As an artist, myself, it makes me feel closer to this man whom I feel so drawn to, yet, never knew. The Ditty Box was given to me when I was eight years old and held many records of my family's past. 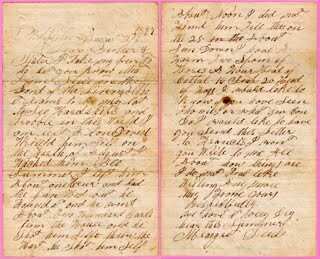 Inside were hand-written letters dating back to 1820, original photographs in pristine condition, deeds, land agreements, court documents, sales receipts, newspaper clippings and much, much more. 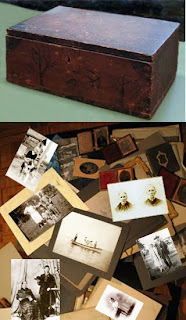 So much history placed carefully inside a simple wooden container less than twelve inches wide. The collection dated back to the days of my Great Great Grandparents, Francis Edward and Angeline Ives (seen side by side in the upper right photograph in the image above). Francis Ives kept everything written on paper he deemed important to remember and thus passed the collection down through subsequent generations who added more and more to the contents as the years passed. I feel incredibly fortunate to have this collection in that it tracks my family's history in personal and descriptive details most genealogists could only hope to find. Without even going to official records or archives, my family is recorded back six generations and the people and places to which they traveled or lived are described in such detail as to make them more than just a group of unknown people with names and dates. These family members have come alive in both photograph and written word. I feel so honoured and privileged to own such a collection that makes my past and my family real persons. Alas......not all family's are as fortunate. A quick glance at the newsstand offerings or television show schedules reveals that others desperately seek answers to their past. Because of the demand for answers and information, the internet is filled with sites and locations for genealogical research and cities, libraries and associations are being asked to get their records digitized and/or online for ease of research. When people neglect to write and record their history the past is forgotten and information is lost. One thinks the most mundane information isn't important enough to write down or that, surely, future generations will remember everything that was told to them but, this simply isn't true. While exhibiting my restoration services at an Italian Heritage Conference, in Canada, in 2009, my good friend, Henrietta, was speaking to a group of attendees trying to impress upon them the importance of submitting their family histories to her Italian research project. The group was resistant to the suggestion that it was important to record each and every family's memories and histories. Several claimed, "I know who I am and my children don't care about the information." With that statement, Henri calmly and emphatically stated, "You're absolutely right. You're children don't care. You're not recording your history for your children, you are preserving it for your Grandchildren and future generations. It is them who will care and who will need to know who they are and where they came from." Wow! Truer words were never spoken. It seems that everything skips a generation. During the Depression (the first one!) families had to scrimp and save, make their own clothes, construct their own quilts, put up fruit preserves, smoke meats and more. I'm not old enough to have lived through the Depression, but growing up, year after year I, myself, was expected to help can vegetables, cook relishes, pack pickles and stuff the freezer full of cut corn and other necessities to get my parents and siblings through another single winter to the next growing season. I can't recall how many times have I heard people state that their lives were filled with such demands they would never place the same expectations on their children or that their children took no interest in their parent's pursuits be it demands or pleasures. I never made this claim myself but, I suppose I am guilty of it's train of thought. Although I did teach my daughter how to sew, she can no more make jam than she could knit a sweater or use my table saw. It just didn't seem important to pass on these skills to her and she showed little interest in what I knew how to do in some areas. My mother, Betty Ives, is a world renown quilting instructor and has spent most of her career teaching young (and older) woman how to quilt. These are woman who's Grandmothers quilted but, who's mothers were never given the information because it was not a necessity and they could just as easily purchase a blanket at a department store as they could invest in fabrics and hours of time to make something to keep them warm. The quilting technique and skill was lost only to be desired by that third generation. You're not doing it for your children, you are doing it for your Grandchildren! With that thought in mind, and another reminder to write down information and save it for those who come after you, let me leave you with the following poem. It is something I have had in my collection of writings for some time and, unfortunately, cannot claim to know it's author or origin. It is, however, a most remarkable and heartfelt piece of literature which I wish to share with you all. "The Strangers In The Box"
"Things Go Better With Coke"
The first Coca-Cola recipe was formulated in the mid-eighteen hundreds at the Eagle Drug and Chemical Company, a drugstore in Columbus, Georgia by John Pemberton, originally as a coca wine called Pemberton's French Wine Cocoa. In 1886, when the City of Atlanta and surrounding Fulton County passed prohibition legislation, Pemberton responded by developing Coca-Cola, essentially a non-alcoholic version of the French Wine Cola. The first sales were at Jacob's Pharmacy in Atlanta, Georgia, on May 8, 1886. It was initially sold for five cents a glass at soda fountains, which were popular in the United States at that time due to the belief that carbonated water was good for the health. About nine servings of the soft drink were sold each day and sales for that first year added up to a total of about fifty-dollars. The ironic thing about sales was that it had cost John Pemberton over seventy dollars in expenses to produce the product. The first year of Coca-Cola sales were, for the times, at a huge loss. Until 1905, Coke concentrate, or Coke syrup, was marketed and sold as a patented over-the-counter medical tonic containing extracts of cocaine as well as the caffeine-rich kola nut. The product was touted as a remedy for nausea or mildly upset stomach. Pemberton claimed it cured many diseases, including morphine addiction, dyspepsia, neurasthenia, headache, and.....oh, wow.....impotence. The product could just take care of it all! The original 1886 advertising slogan was a simple "Drink Coca-Cola". Subsequent years produced many of the most well remembered slogans and ad campaigns as any product ever produced. Isn't this interesting? Certainly, but, what does an international passion with a soft drink have to do with any possible subject that could be posted here? An even better question: why is there an image of the Fayette, Alabama Courthouse shown in conjunction with the all too famous beverage? The answer to all these questions goes back to a customer's phone call to the Heirloom Art Studio wayyyyy back in 1999. 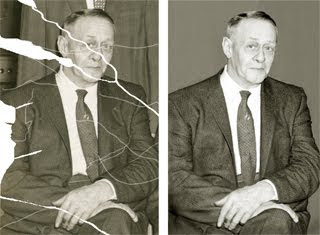 In the fall of that year I received a phone call from an Alabama gentleman that had been on the hunt for a photographic restoration artist and conservator that had the skills he needed to help with a very historic project. It seemed the man had recently purchased an early nineteen hundreds home and made the most fabulous discovery inside it that would require my expertise and special handling. While searching the attic of his new home, the gentleman had discovered what he thought were broken and scratched shards of glass between the support beams of the attic's roof. Collecting the fogged and dusty pieces of glass from their long time resting place he discovered, upon closer inspection, that there seemed to be blackened images of people, places and buildings upon one side of the glass. Spreading the damaged glass out under lit conditions, the pieces revealed a collection of 8"x10" glass negatives in various states of scratched or broken condition. Of particularly historic importance were two of the negatives which led him to seek out my services as one of the remaining persons still printing glass negatives in the darkroom. 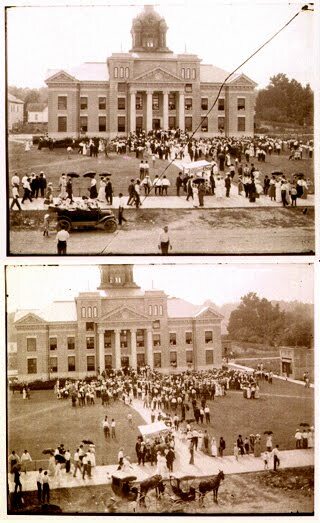 To the man's eye, these particular negatives appeared to be the 1911 dedication of the Fayette, Alabama Courthouse. 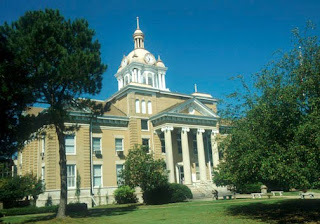 The year 2000 approach of the next Millennium was expected to bring a re-dedication of the City's Historic Courthouse. If proven to be, in fact, authentic images of the original dedication, the gentleman wished to have the negatives printed and restored for presentation to the City of Fayette upon their upcoming celebration of the building and the City. After giving explicit instructions as to how to pack and ship the negatives to my Studio, I hit the research trail to see what I could discover about the original construction of the Courthouse. It seemed that this was the second Courthouse to be built in Fayette, a City named after the Marquis de LaFayette, who helped George Washington fight in the American Revolution. The first Courthouse, as well as most of the City, succumbed to a devastating fire in March 1911. The following newspaper accounts were found in The Montgomery Advertiser as well as a Birmingham, Alabama Newspaper. FAYETTE IS ALMOST WIPED OUT BY FIRE. LOSSES ARE ESTIMATED AT FIVE HUNDRED THOUSAND DOLLARS. MANY BUILDING BURNED-Among Those Destroyed Were The New Court House and Jail, New Hotel, Bank Building, Cotton Warehouse and the Masonic Temple. Birmingham, Ala., Mar. 24.-Considerable interest was taken in the fire that raged for several hours this morning at Fayette, eighty miles west of here on the Southern Railway, in the heart of the natural gas fields, because of close interests held by Birmingham people in that section and the trade that comes this way. The fire started in the drug store of Peters and Young and it spread rapidly from building to building. Three hundred fifty bales of cotton, belonging to one firm alone, were destroyed, besides much other cotton. The estimate made this afternoon of the loss by the fire is given at more than $500,000, with less than $150,000 insurance. The buildings destroyed included the $40,000 court house and jail, the new hotel, the bank building, Peters and Young’s drug store, Jones Brothers, general merchandise; Fayette Banner office, Masonic Temple, (two stories); Miss Emma Shepherd, millinery store; W. Anderson, jewelry repair store; Smith, Dodson and Company, general merchandise; Walker Bros. & Co., general merchandise; J.R. Robinson, grocery; E. Rose & Co., general merchandise; Knuckles & Walker, general merchandise; Berry Brothers, grocery, City Restaurant; G.T. Hassie & Co., general merchandise; W.M. Cannon, general merchandise; Robertson & Dodd, general merchandise, S.J. Cannon, drug store; Propst Bros., hardware and furniture; Propst Bros., (2-story brick), general merchandise; Farmer’s Warehouse; S.J. Sanders, livery stable; Jeffries Livery stables; eight residences and other buildings. Fayette, because of the discoveries of natural gas within a mile and half of the town, has been on a big boom and much building was under way while the population has been on a steady increase. The town is said to have a population of nearly 2,600. A report reached Birmingham this morning that the fire started from someone having a lighted match near a leaking gas pipe. The people of Fayette exerted every effort to check the blaze, but in vain. The fire raged on the main thoroughfare of the town down Temple Avenue. Fayette was established during the Civil War. The negatives in question arrived at the Studio and research and dating absolutely confirmed that they were taken on the very day the Fayette, Alabama Courthouse was rebuilt. Although the recorder of the event has still to be determined, the fabulous images showed the dedication day ceremonies as they transpired throughout the day. Oh, how I wish that you could all see these photographs up close and in person. The town folk, clothing, children playing, horse and buggy in one image but automobile in the next...........and so forth. The closeup activity is history in itself, although I have yet to figure out why one well dressed woman carries a suitcase up the front walk. Is she heading out of town after the ceremony or is she bringing a wicker basket with the picnic lunch? There is no way to tell. While processing and perusing through closeups of the crowd, however, two distinct facts did became abundantly clear. First, one cannot help but notice that although everyone in the crowd has turned out in their Sunday best and appears equally attired, the crowd is most definitely segregated. We are, after all, recording an event taking place in the American South, in 1911. Where the white residents mingle throughout the front and center of the lawn, the black attendees stand in groups to the right and left of the Courthouse. One close up detail can be seen below. There is even one person sitting in the second from the left, lower window that could possibly also be black. As a Canadian Citizen, born and raised near where many Civil War Slaves considered the end of their Underground Railway, I can only stare at these negatives and handle their recorded history with both shock and awe. My historically different upbringing has me holding these original pieces of the past with honour and great respect for American History as well as an understanding yet heartbreak for the trials and tribulations of the struggles of its Southern People. 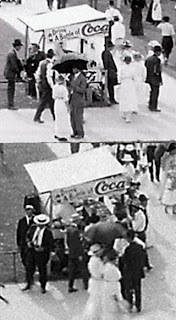 The second, most unique, discovery in these images is that, regardless of the solemnity of the event...................................THINGS REALLY DO GO BETTER WITH COKE!!!! Positioned prominently on the lawn of the Courthouse, at the corner of the main roadway and the walk to the Courthouse entrance is the Coke Booth. The banner hung around the stall says: Drink a Bottle of Coca-Cola. My husband and I have worked many an hour at charity events operating the Coke booths that the Coca-Cola Company now provides and delivers on wheels with their self-contained, hitched trailers, but, I swear, after so many hours in the darkroom, I honestly thought I was seeing things. I expect to see the ever present bold red Coke signage in contemporary photographs, but while working with such an importantly historic set of negatives I never dreamed of finding this little piece of accompanying humour and historic record captured along side the first historical intent. Coca-Cola was first sold in bottles on March 12, 1894. I checked the company's records for recorded advertising slogans and did not find the one captured in our 1911 negatives. Perhaps the company will now have to amend their history to claim that Alabama vendors had their own advertising slogans. It is a wonderfully warm and sunny Sunday and I am about to head outdoors to work in the gardens and spruce up the grounds for spring. But first, I believe it is time for a break and a cold drink. Perhaps you will also feel the same and join me. Things go better with Coke. Drink a Bottle of Coca-Cola. 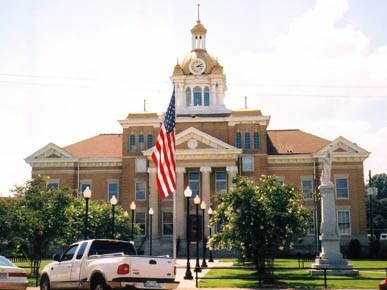 By the way, the Fayette, Alabama Courthouse negatives were successfully printed, evidence of the broken pieces and the thousands of scratches were removed and enlargements of both of the images were delivered to the Courthouse in time for the year 2000 re-dedication and Millennium Celebrations of the City of Fayette. I have no way of confirming that a Coke booth was present at this second prestigious occasion. This week I made a new friend in the acquaintance of one, Bill Tracy, a recent follower of my blogs. Bill made some wonderful comments and admiration of my writings and referred me to his blog site thinking I might show equal interest in one of his thoughts. His insightful blog entitled "Web Log As Family History" (Seen in its entirety at this link) ponders whether the day and age of internet blogging and web logs may lead to the eventual loss of thousands of words not in other ways recorded. Bill asks the question: will thoughts and diaries written on the internet be archived for future generations to research and recall or will, with no other written and recorded accounts created, the words of today's people be lost and subsequently forgotten through future time? Bill's words got me seriously thinking about the importance of traditional writing, recording names, dates, events, thoughts and family history in methods other than digital or internet postings. 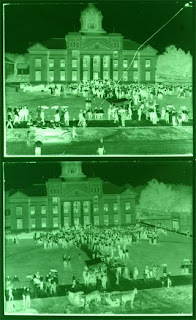 Of absolute importance to the recording of history, DO identify and label all your photographs. So many generations never labeled or identified their photographs and the identity of the faces and places are now a mystery........and a forgotten shame. Absolutely NEVER, however, write on the front or back of photographs in pen! A pencil isn't highly recommended either but, it is better than ink. I cannot tell you how many times I have dealt with water and flood damage in a customer's home where stacks of photographs were presented to me stuck to each other. Photographs in this condition can be salvaged, but upon separation, when written upon, usually reveal that the ink on the back of a top photograph transferred to the surface gelatin of another causing permanent damage to the surface of the photograph underneath. The archival way to identify photographs is to use a pencil to do any and all recording and second to simply number each photograph and record all details and data about the photograph in an accompanying book or filing system. It is important to write to your heart's content about the people, places and events in each photograph but, do this on a separate location, NOT on the front or back of the photograph. 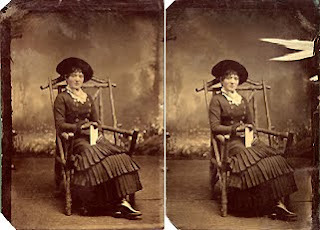 Several methods of numbering photographs can be done. You can store each photograph individually in an archival (acid-free) envelop with an assigned number, place the photograph in an archival transparent sleeve which can be identified with an archival attached number sticker or purchase archival albums that contain pages that have strips for writing above, beside or below the photographic sleeve. When it comes to identification and retaining information writing is a must. Just identify and log the photograph and do the recording on accompanying paper, not on the photographs themselves. You would never invite another to your home, however often you may have met them elsewhere, until you had first called upon them in a formal manner at their house and they, in return, then wished to visit you. This was a kind of safeguard against expecting any acquaintances to show up which were thought to be undesirable. The person making the call would be led to the drawing room while the footman ascertains verbally whether the Master or Mistress of the house was "at home" to receive company. In fashionable circles, it more and more became the custom to dodge the burden of unwanted visitors by being officially "not at home" whenever visits of formality were made. Upon finding the homeowners at home, everything about the visit was regulated from the number of buttons expected to be on one's gloves, acceptable and non-acceptable topics of conversation to the menu for food and drink. Social conduct then decreed that, following the visit, the appearance of the guest was appropriately recorded in writing by leaving a calling card. An unaccompanied married lady left one calling card of her own and two of her husband's---one of these intended for the man of the house and one for the lady. When leaving cards on behalf of her husband, the wife left those on the silver tray or basket on the hall table, never on the drawing-room table where she left hers. Calling cards have long since evolved into the company business card with less restrictions of social behavior. My point in bringing this item to mind, however, is to point out that one's presence was, at this time in history, recorded. Although calling cards were pre-printed in masses, the names of guests were forever left at the door to be saved as a remembrance of people's presence. In another entry I spoke about the myriad of items my ancestors saved. One of the many items I inherited was an album of calling cards. These records ranged from simple cards of names in hand-written script to ornate paper and aluminum embossed cutouts that were lifted to reveal the pre-printed name of the caller. I show a number of examples of such items from my personal collection below. Imagine holding the name card of your own ancestors. Holding a very object that not only identified the family that came before you but, was actually handed out by them in hopes that others would remember and record their presence and visit. If it were not for the written word on paper or card, these people and their names may have been lost forever. 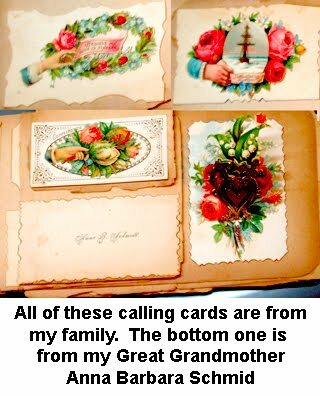 I can say that these calling cards revealed many a missing ancestor in the puzzle of my family as did they reveal many middle names and initials since it was important in the past to formally use one's full name when making a call. What treasures! In the absence of discovering a collection of calling cards, imagine looking for signatures. Assuming your ancestors could write, at the very least, search for anything they signed. A simple thing, but as you attempt to locate a photograph of each member of your family imagine how much additional insight and information you could learn by matching their signatures with their images. Just imagine seeing a signature of every family member who influenced, or was responsible for, your life. Here are some of my family members. Finally, let us discuss the importance of the written word in full paragraph and prose. to be my lot to see hardships and trouble in this world. I have a farm, two spam of horses and four head of cattle, 16 sheep, 20 head of hogs. I would like to know if you have seen Thomas or what you can do. I would like to have you send this letter on to Francis. I want you to write to me all about how things are. I do not feel like letter writing any more at this time. We have it very dry here this summer. This letter tells of a tragedy, no doubt, (including that very important, and necessary, farming report about the weather) but wouldn't it be worse if this hand written piece of history were never written down, never saved and never passed down to generations to come afterward? Without this single piece of actual writing on paper no one alive today would have known how David Deeds ended his time on this Earth. 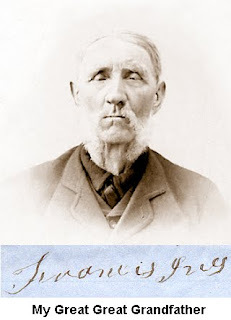 I tracked down descendants of Margret and David Deeds in the mid-western United States and can attest to the fact that, until the letters found in my Great Grandfather's Ship Captain's ditty box were handed to me and transcribed, not one other family member knew anything about David except his birth date. No one had left a record about him or his method of passing. Only the written word handed down to me has kept this information alive. Truly more tragic than this letter is another, written three years earlier, where Margret writes home to tell her family that her despondent 17 year old son also shoots himself through the heart this time. Imagine a Mother's overwhelming sadness but, I, alone, had the information in my possession and, again, only the actual hand written but, aged papers, keeps my family alive. I am looking for the missing grave locations of five brothers and sisters who passed away at young ages in the mid 1800's. No one thought to write down where the precious children were laid to rest----not even the government. Nothing was written down, I cannot locate their graves and nothing remains of their existence. What a shame. Alas, now we have web logs, internet blogs, chat rooms, bulletin boards and email all of which produce quick and immediately viewing, but do these musings have any permanence? I have read some of the most profound thoughts on the internet, but fear that some day these thoughts and words will vanish from view. Will they be archived in some vast repository able to be searched by title and author in generations to come? In answer to Bill Tracy's query, I am seriously doubting it. I was seventeen, in the mid 1970's when I went off to university in another country. Long distance phone calling was reserved for a once a month major expense. Letters written and sent throught the Post Office were the only things that kept my family and friends informed of my activities and my presence. Little did I know at the time, my parents kept every item I wrote to them as a record of my adventures and advancement toward my future in arts and education. As I became faced with the out of country university departure of my own daughter, Tania, in the year 2000, the internet had become one with our lives. Although daily contact and Instant Messaging had taken the trauma out of Mother/Daughter separation my Mother knew, I felt a loss of permanence in that so much of my child's learning and adventures would never be remembered beyond its initial reading. I began to print out each and every computer contact and conversation between us and preserve it forever in a book. Many years after she graduated with a Bachelor of Science Degree in Digital Animation I was attempting to bring Tania's attention to a particular matter and parallel her current experiences with an event in her days at University. Her bemused look was only followed by the single comment, "I don't remember that". I stood without speaking, retrieved the now overstuffed binder of dated pages from it's place of honour in the top shelf of my book case and handed the book to her saying, "Perhaps you'd better read this." She was overjoyed to recall what, until that time, had been the best years of her life. A mother remembers many things forgotten by others over time. Some things about her life and the lives of her husband, children and extended family are just worth remembering and worth writing down. This latest written addition was just an accounting of a young girl's journey into the world, a memoir of her self-discovery and growth, but names, dates and details are worth remembering by all. History only becomes history (right or wrong) because it is written down, recorded and filed for safekeeping and passed on to the next generation. History, of all kinds, is worth remembering. Do I think everything talked about on the internet will be retrievable information by future generations? Not really. One written word is worth a thousand pieces of gold. Write it on paper and pass it on for all to read. It will become a treasure with priceless value. To emphasize my point about the written word I would like to point out the bottom of a legal document from July 24, 1857. The transaction involves my Great Great Grandfather, Francis Ives and his Brother In-Law, the above discussed David Deeds. Notice that by the statement "David Deeds his mark" followed by the appropriately placed X, indicates that David Deeds cannot write and is incapable of placing his signature upon the legal document. An attestation that he makes his mark (that of an X) is all that our David is capable of doing. Only by the hand writings of his wife do later generations of David's family know about his fateful demise, yet the man, himself, could not place even his own name onto paper and could leave us no written words.